May 14th was centered all around celebrating school achievements for the kids. 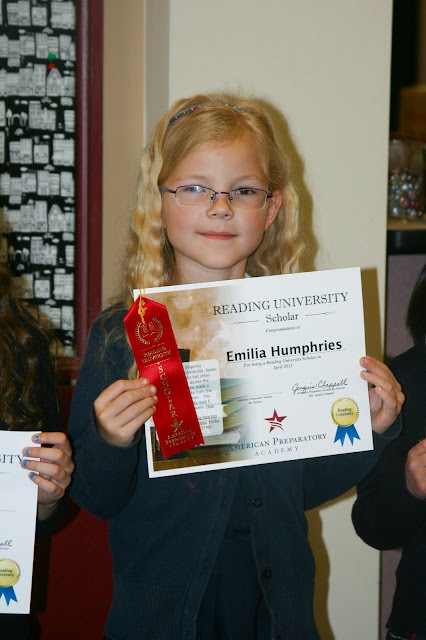 Early that morning Emilia was recognized as the reader of the month for her class during their morning assembly. This is what her teacher, Mrs. Pereira had to say about Emilia: "Emilia has been diligently reading Reading University books each month without fail, often reading more than double the amount required. She reads a wide variety of books from the library in our clarssroom. This month she has already read 6 books, among those were How the Camel Got His Hump, Thidwick the Bick Hearted Moose, and Amelia Bedilia. Emilia you are a ROCKSTAR!" I was happy that she was recognized for her hard work and perseverance in reading through out the year.